2000 by GH Productions Inc. 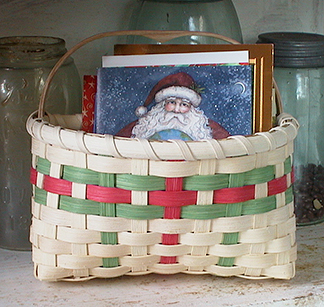 This Holiday Card Basket is fun, quick, and easy-to-make. It measures 8" x 5" x 8" including the 8" Ash Heart Handle. 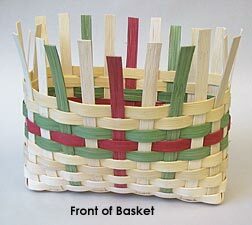 The basket has a filled base, is flat in the back and 'bowed out' in the front, and the sides are independent rows of 1/2" Flat Reed in natural, green and cherry red. Calculate Supplies for 1 to 20 Holiday Card Baskets with the Basket Supply Calculator. The Supply List gives you the least expensive way to purchase the supplies for your quantity of baskets. View on-line or print to your printer. Rinse the dyed reed and wipe it on a towel before using. As you weave, gently adjust the back stakes to keep them vertical and spread the front stakes apart to create a 'bowed out' shape. 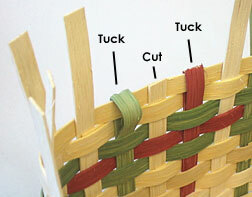 As you weave the sides, work with your weaver fairly wet and do not leave spaces between the rows. 1. Cut 3 stakes 22" long and 6 stakes 16 1/2" long from 1/2" Flat (natural). Cut 2 stakes 16 1/2" long from 1/2" Flat (green) and 1 stake 16 1/2" long from 1/2" Flat (cherry red). Cut 2 base fillers 12" long from 1/2" Flat (natural). 2. Mark the center of each stake and filler on the rough side of the reed with a pencil. Soak all these pieces for a couple of minutes in warm water—soaking the dyed material separately. Before using the dyed material, wipe it on a paper towel to remove as much extra dye as possible. 3. Lay the long (22") stakes and base fillers (rough side up) horizontally on your table, matching the pencil marks and alternating stake, filler, stake, filler, stake. Push these pieces tightly against each other. 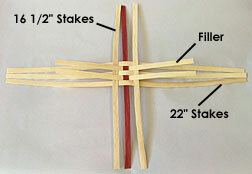 Weave the red stake across these center marks—weave under the stakes and over the fillers—and align the center mark of the red stake with the center mark of the long middle (22") stake. Weave 1 natural stake (over the stakes and under the fillers) on each side of the red stake and space these stakes about 1/2" from the red stake. See Photo. 4. 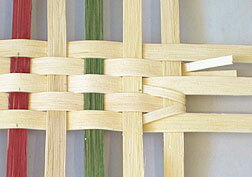 Interweave 3 more stakes (1 green, 2 natural) alternating the over/under weaving pattern on each side of the base. See Photo. When all stakes are in place adjust the base to measure approximately 2 1/2" x 8". Space the vertical stakes as evenly as possible on each side of the center red stake. Rewet the reed at the edge of the base then crease each stake and filler upward at a right angle. Trim base filler pieces to a length of 1 1/2" from the crease. Cut each filler through the center to the crease making 2 narrower ends. Spread the 2 ends apart and tuck each piece under the second stake from the end. See Photo. NOTE: As you weave, you must square off the weaver in the back corners and spread open the corners and the stakes on the front side. Keep the weavers wet as you weave the sides. 5. 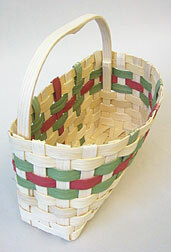 Each row of the basket's sides is woven separately. You need a total of 10 rows of 1/2" Flat—including 2 rows of green and 1 row of red. It's helpful to use clothespins to hold the weavers in place on the first couple of rows. See Photo. 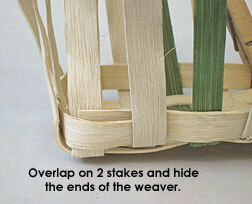 Begin and end every row on the back of your basket; overlap the ends on 2 stakes and hide both ends of each weaver behind the stakes. See Photo. Change the starting position of each row, keep the back flat, continue to square the back corners, and 'bow' the front of your basket as you progress. See Photo with all the rows complete. 6. After weaving 10 rows, soak the ends of the stakes that extend upward beyond the weavers in warm water for about 2 minutes. Working with every stake where the top row of weaving is on the inside of that stake, crease the stake at the edge of the top row, cut it to length so that it will be hidden by the third row of weaving (from the top), and tuck the stake under the third row on the inside. See Photo. Cut the remaining stakes even with the top of the basket. 7. Sand the handle if needed. Insert the ends of the handle under a couple of weavers (on the inside of the basket) along the side stake that is nearest the back of the basket. Align the handle's shelf notches with the top row of weaving. See Photo. 8. Cut your rims from 1/2" Flat Oval. The length of your outside rim is equal to the distance around the top of your basket plus about 3" for overlap—the inside rim is about 2" shorter. Carve away some of the thickness where rims overlap then soak the rims for several minutes. 9. As you attach the rims and rim filler (sea grass) around the top of your basket, position the outside rim overlap on the back of the basket and position the inside rim overlap on the front. Overlap the sea grass near the outside rim overlap. Secure rims and rim filler tightly to the basket with clothespins or twist ties. See Photo. 10. To begin your lashing, secure a wet piece of 1/4" Flat Reed between two stakes, under the inside rim, under the filler and under the outside rim. Turn the lashing so that its smooth side will be out as you lash over the rims. See Fig. Working left to right from the outside of your basket, lash over the rims and between each of the stakes. Pull the lashing tight with each stitch. Remove the clothespins or twist ties as you progress. 11. 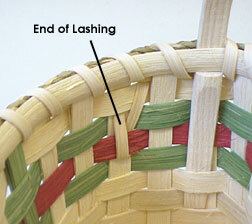 To finish, secure the end of your lashing behind 1 weaver on the inside of your basket. Bend the end upward and tuck under 1 weaver. Trim the excess lashing. See Photo. 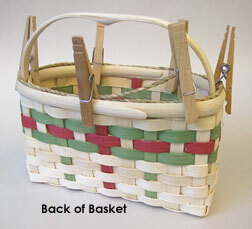 Gently shape the basket and rims—flat on the back and more rounded in the front. Enjoy your Holiday Card basket!